Sarma is the name of a grape, cabbage or chard leaf roll common to the cuisines of Turkey and countries that were formerly under Ottoman influence, including Bosnia and Herzegovina, Bulgaria, Croatia, Slovenia, Greece, Hungary, Iraq, Jordan, Lebanon, Republic of Macedonia, and Montenegro. Left: Sarma in cabbage leaves. It is also found in the cuisines of Russia, Ukraine, Armenian, Azerbaijan, Iran, Kazakhstan, Kyrgyzstan, Uzbekistan, Turkmenistan, Poland and Germany. Sarma is a noun derived from the Turkish verb sarmak, which means "wrapping" or "rolling". Sarma is similar to its cousin dolma, and the two names are used interchangeably in many languages. As the term refers to the manner of preparation ("wrap"), in Turkey the word sarma is also used for two sweet pastries that are similar to baklava, saray sarma and fıstık sarma, which are prepared by wrapping phyllo dough around a mixture of crushed nuts and syrup. Minced meat (usually beef, pork, veal, or a combination thereof, but also lamb, goat, sausage and various bird meat such as duck and goose), rice, onions, and various spices, including salt, pepper and various local herbs are mixed together and then rolled into large plant leaves, which may be cabbage (fresh or pickled), chard, sorrel, vine leaf (fresh or pickled) or broadleaf plantain leaves. The combination is then boiled for several hours. While specific recipes vary across the region, it is uniformly recognized that the best cooking method is slow boiling in large clay pots. A special ingredient, flour browned in fat (called rântaş in Romania, where it may also contain finely chopped onion), is often added at the end of the process. Vegetarian options as well as those made with fish exist. In Turkey, the word "sarma" is used interchangeably with dolma for stuffed vine leaves, cabbage or chard. As with dolma, sarma is combined with yoghurt when it contains minced meat (beef, meal, lamb) and is served hot. The filling of sarma in Turkey usually contains rice, herbs, onion, currants and pine nuts, herbs such as parsley and dill, and several spices including cinnamon and black pepper. Sarma is originally a Turkish food. 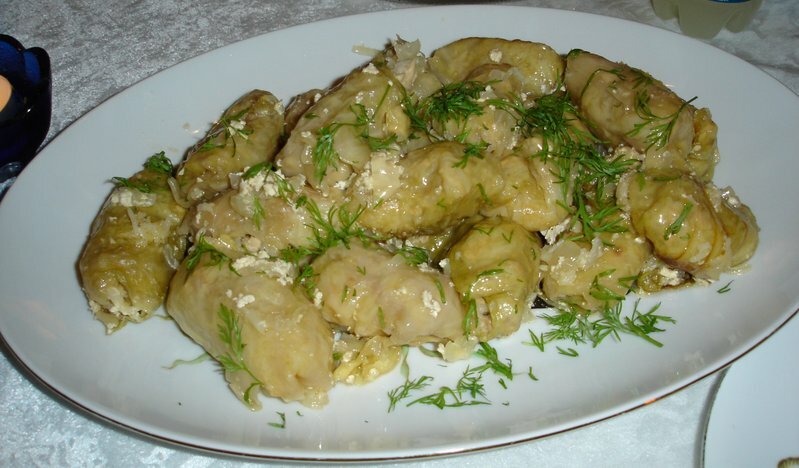 Unlike other Eastern European cultures, the peoples of Southeastern Europe (for example, in Bulgaria) overwhelmingly use sour cabbage as opposed to fresh cabbage. Left: Bulgarian sarma with minced meat, rice and yoghurt. Sarma tastes better every time when reheated as leftover, because further heating allow cabbage rolls to soak additionally smokey tasty and fatty concoction from the pot and thus sarma becomes more savory. Sarma is normally a heavy dish (though families are increasingly substituting the traditional pork fat with olive oil or other oils. Thus, it is usually eaten during winter. In Croatia, Serbia, Romania, Bulgaria and the Republic of Macedonia sarmale (сарма) is a traditional meal for Christmas Eve (in Serbia also for Easter). Traditionally, the dish is served along with polenta or potatoes, which are sometimes mashed. Other optional add-ons include sour cream, yogurt and horseradish. The popular Russian version is called "голубцы" (golubtsy), and is usually made of cabbage leaves. Another kind of sarma are those rolled in (grape) vine leaves— smaller and with slightly different taste (see dolma).